It’s official. Everyone is back in love with vinyl. 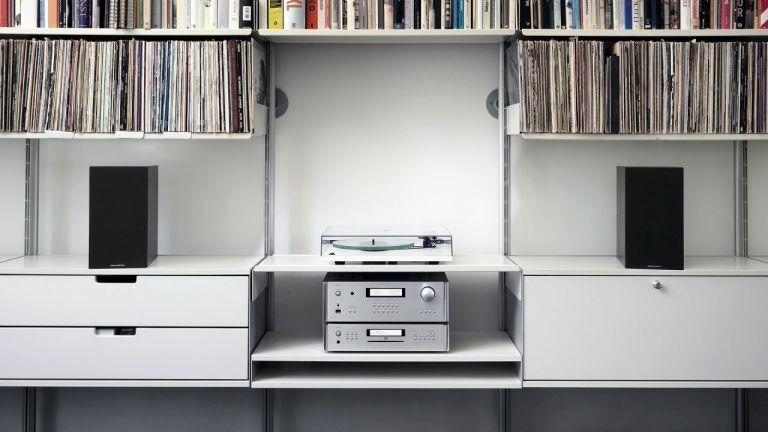 Turntable sales are booming, 12-inch albums are back in fashion, and Ikea is selling collector-friendly Kallax shelf units by the truck load. Streaming music services are all well and good, but the tactile pleasures offered by physical records, and the ritual associated with playing them, is something else entirely. But if you’re new to the hobby, or rekindling an old passion, there are things you need to know about the vinyl renaissance. When it comes to hardware, not all record players are created equal. Turntables range from low-cost all-in-one transportables to stratospherically priced objets d’art. If you’re shopping on a budget, Crosley will be your go-to brand. It dominates the bargain basement with offerings like the Crosley Cruiser. This retro-styled briefcase, available in all shades of everything, offers built-in stereo speakers, a headphone jack and mini-jack input for a separate music player. Priced at £80 or less, it’s hardly audiophile, but folks dig the Beatnik style. Still, with vinyl priced north of £20, would you really trust new discs to Crosley’s heavy tracking needle? While even the cheapest record deck will spin a record, the quality gap between a budget buy and something more accomplished is pronounced. On a cheapie deck, you won’t simply hear all the music in the grooves. It’ll literally scratch the surface. And there’s no option to upgrade hardware at a later date. The simple truth is a higher-spec player will be consistently more entertaining to listen to. What’s more, it’ll provide you with the opportunity to maintain and improve performance at a later date. The sweet spot for turntables is actually between £250 and £399. There are some sensational players to be had here, from the likes of Audio Technica, Rega, Onkyo and Pro-Ject. And they’re far from cookie-cutter. Most decks in this happy hi-fi hunting ground are belt drive, but you will find a direct drive model if you look hard enough. Popularised by Technics, direct-drive models have a motor directly connected to the platter (also known as the round thing you put the records on). They are reassuringly low maintenance, because there’s no rubber belt to stretch, get up to speed instantly, and keep flutter preposterously low. One such player is Onkyo’s CP-1050. It hits a suitably retro pose, with its quartz-locked, die-cast aluminium platter and S-shaped tone-arm. For a more modernist option, cast your peepers at Pro-Ject’s RPM 1 Carbon. This belt-drive beauty features an uncoupled motor and platter. Here your furniture will have just as important a part to play as the deck itself (more on this later). A lot of modern turntables offer dubbing functionality, allowing you to digitise that first needle drop for posterity. Most simply provide a USB output, and expect you to rip using Audacity on your PC. Sony, however, rewards PS-HX500 owners with software that copies discs in high-resolution DSD format. Of course, if you want to splurge, there are some special record spinners. Technics’ £2,999 SL-1200G may ape the iconic design of yore, but it sports all manner of techy innovation. Obviously it sounds sensational, but you should plan on partnering it with high-end components (we’d suggest Technics’ own SU-G700 stereo amp). But we’re only scratching the surface. What is a phono stage? The phono stage is there to amplify the very small signal produced by the cartridge that’s plugged into the end of the tone arm (which is typically a few millivolts). Sometimes called a phono-preamp, it provides a bridge between your record deck and amplifier. Th e signal from the cartridge needs to be amplified to a 1V line-level signal before it becomes a source loud enough for your amp. Plenty of record players feature a phono stage built-in. Models like the VPI Player, T&A G2000, Audio-Technica AT-LP3 and AT-LP5, and Sony PS-HX500 make life easy, allowing a direct line connection between turntable and amp. If your turntable doesn’t have one, look to your amplifier, preamp or AV receiver, as these may well have one built in. Th e telltale signs are a designated phono input and Ground spade connector on the rear, which tethers to the turntable. These fell from favour when the record industry shifted to CD, but since the vinyl resurgence, it’s made a bit of a comeback. If there isn’t an integrated phono stage, you’ll need a separate phono-stage preamp. Th ere’s a plethora of these available, so you can buy on brand, style and price. Here’s a tip: even if your record deck has a built-in phono stage, a separate one represents a significant upgrade in sound quality. Th e precision offered by an external box should far outperform any basic provision within the deck itself. Cartridges come in two flavours: Moving Magnet and Moving Coil. They are essentially two ways of slicing the same cake. A moving magnet (MM) cartridge has a magnet which moves inside a coil of wire. A moving coil (MC) cartridge takes a slightly different approach, in which the magnet wraps around the coil. MC cartridges are more fiddly to make and cost a good deal more. They also proffer a lower voltage and thus demand greater amplification. Apart from the mechanics of cartridge design, they are subtle sonic differences between the two approaches. Not only are high-output voltage moving magnet cartridges cheaper, they offer a more pronounced bass, making them particularly suited to dance tracks or rock music. Low-output voltage moving coil cartridges are thought to be intrinsically more dynamic. This plays well if your record collection is more classical or orchestral. While MC cartridges have their supporters, most of us will happily use an MM cartridge. Upgrading your cartridge is no more difficult than slotting the colour-coded pins into the tonearm, but it’s worth talking with your friendly neighbourhood specialist retailer about your system and the tonearm you’re using before making an investment. Some moving magnet cartridges allow you to upgrade the stylus, which could eke even more detail from your records. Tonearms need to be light and stable, allowing a cartridge to accurately track the record groove. Th e most common type are pivoted (let’s stick with these for this introduction), and distinguished by their shape – straight, J or S shaped. Th ere are arguments pro and con, but armtube shape is largely an aesthetic choice. All pivoting tonearms come with a counterweight and anti-skating adjustment. Using the instructions supplied with the deck, a tonearm only takes a few minutes to set up. It goes without saying that a wonky table is not a good perch for your prized new possession. Every record player needs a stable, level playing surface. Th ere are dozens of specialist AV and hi-fi furniture suppliers offering a wealth of stands and racks which guarantee isolation. Without some element of isolation, movement within your listening room could be transmitted from the floor into the tonearm. Resonance is your enemy. A cartridge isn’t generally smart enough to distinguish between groove modulation and unwanted vibrations emanating from elsewhere, and could theoretically assimilate both into its electrical signal output. However, optional isolating feet for your turntable are one quick and easy solution for this. You might also consider upgrading the platter mat, to further minimise vibration. Unlike CD players and discs, which are generally low maintenance, vinyl merits a little TLC. Clean the stylus with a dedicated cleaning brush. Ideally, you should clean the stylus before every record is played - unlock the tone arm and brush in a back-to-front direction. A stylus should last for around 1,000 hours before it needs replacing. Finally, and most importantly, store your records upright to prevent warping – don’t lay them down flat. And when you pull them from their sleeve, avoid touching the playing surface with your fingers if you can. If you need to, a carbon fibre brush can be used to remove surface dust. Specialist cleaning fluids are also available if you’ve been careless with the nachos. This feature is from the new-look, relaunched T3 magazine! To get more features like this before anyone else in our stunning, new-look mag, subscribe today or get the issue FREE with a trial of our custom-designed iPad version or our Android app.